About this post: I had many questions on my mind before my trip to Iran. Why go to Iran? How is Iran as a country? Is it safe to visit Iran? What is Iranian culture like? A month in Iran later, I think it might be one of my favorite places in the world. This post is my humble attempt to show you why. Most people think that now is a terrible time to visit Iran. The renewed US sanctions on the country mean that popular travel websites like Expedia, Airbnb and Booking.com don’t work in Iran. International debit and credit cards can’t be used to make payments or withdraw money from ATMs. Most travel insurance policies don’t cover Iran. And social networks like Twitter and Facebook are technically banned. And yet, spending a month exploring Iran in Feb-March 2019 – thanks to the local all-women team of travel company Uppersia – filled me with immense wonder at its architecture and natural beauty. I fell in love with the country’s people, culture, poetry and language, and believe that NOW is the best time to visit Iran. Move over New York, London, Paris! I highly recommend the Chai and Conversation podcast. A sort of winter lounge in old Persian houses for cosy gatherings. And let “taarof” surprise, confuse and amuse you! Taarof is Persian etiquette where you put others first; read more about it here. Caravan Serais were inns built in the 16th century for travellers along the ancient Silk route. The one in Tabriz is a UNESCO World Heritage Site! When women and men were buried with their pots and pans, and weapons. This one is in Tabriz. Because it’s only here that you’ll find Nesf-e Jahan – half the world! Is Iran among your dream travel destinations? What are you most looking forward to? *Note: I travelled to Iran in collaboration with Uppersia. Opinions on this blog, as you can tell, are always mine! PIN this post for when you start planning your trip! Stunning pictures Shivya. Had never thought about Iran, but would definitely look it up now. You seem to have even ventured into the off the beaten track places. Did you ever feel unsafe? Just wondering. I wish I could live right now! That’s lovely post Shivya. Iran has been my dream destination for a long time now but never planned it for obvious reasons. Your post has inspired me to think about it now :). I have thought about going to Iran before but not quite got around to it. These pictures are stunning! Thanks for sharing, and whetting my appetite further. Visit to iran can impact getting US visa later on ? Did you do a custom tour with Uppersia or did you do a package tour and if so, which one? Beautiful pictures! Great post Shivya. Enjoyed reading it. Hey Shivya, following your blogs since 3 years now and I love every bit of it. I certainly have read all your blogs and not exaggerating but I wait for you to upload the new ones. Have been following on your Iran journeys and you have inspired me enough to take my first international trip to Iran. It would be great if you could pen down some insights on ‘How to sort the Visa permissions’ and ‘An estimated budget (maybe!?)’. Wow…I am mesmerised. The pictures are breathtaking and honestly for a person like me who always looks forward to the next travel, you inspired to take Iran as the next destination. It would be really helpful if you rpovide some details about the planning, budget and your tourism partner uppersia, since you get much less information over the internet regarding Iran. Iran has been one of my travel destinations for a very long time, thank you for the stunning pictures ! Iran is certainly one of the most beautiful places on this earth, I never miss any article regarding traveling in Iran. Hope someday I will be able to visit it. You have inspired me to drop everything and visit Iran! It looks gorgeous and interesting. But i think I would never stop being depressed by the compulsory covering I would have to do as a woman traveling there. It’s enough to keep me away. I traveled to Iran about two years ago and your pictures brought back a lot of lovely memories and the urge to go back. Thank you. 🙂 Iran is a truly wonderful place and their hospitality is something else! I am curious about your experience as a vegan in Iran. I struggled finding vegetarian food and was often served korma sabzi with the meat chunks removed. My Iranian friends tell me that they do cook a few vegetarian/ vegan dishes at home but they are just not popular in restaurants. I am from neighboring country Pakistan… i would like to say thanks for showing good image of Iran. I am sunni Muslim and i love Iran and wants to visit 1 day. Hey!! I was wondering if you could tell me how you got your visa? I am going on the 19th and was under the visa on arrival assumption. Is that the case for Indians? Great post with top-notch images. Loved to visit Iran once in my life. Thanks for information. Being a travel enthusiastic Iran is always is in my bucket list! Thanks for writing this post, really appreciate it. Keep writing. you can travel to Iran and see very good place and historical place in it. Yes, it was known as the Paris of the Middle East and the second language was French. Now almost everyone speaks English. I’m happy you enjoyed your time in Iran. Ow.. you make me cry a little. I was in Iran last september and just fell in love with the people, the beauty, the country, the atmosphere. I was thinking about going back to Isfahan next month, just for a week or so. But with the floods it feels kind of rude. The information on the internet is unclear. Iranians shouting out that 3/4 of the country is under water and it is a huge disaster, ignored by the western countries. And others saying there is no problem at all. I don’t know what to believe. For me it just feels too oportunistic right now to go. So, I’ll wait till after summer and try again to go. Because one thing is for sure: I want to go back to Iran. Again and again and again. It really is seems like a welcoming place. Thank you for the information. I was in awe until the end of the blog. Seeing the splendor of the country have mesmerized me, thanks to the photos shared by Shivya. It indeed is an amazing country. History has been well preserved. Too bad the people there aren’t free. I’ve never thought of visiting Iran, might consider it now. It looks beautiful. I have dreamed of going to Iran for several years now. Your beautiful images and descriptions make that longing even stronger. How did you handle the money situation if you can’t use credit cards and ATM’s? What a pleasant travel and experience! I can see it worded every moment! My next trip: Iran! Thanks a lot for share all the information! Beautiful and amazing photos too! I’ve been traveling a lot this year but honestly, I never thought in Iran as a destination, well, maybe yes but Egipt too! You just give me the push, in the right moment! Have a nice day! Phenomenal place. Went in 2017 for work, and am desperate to go back — this time on a personal trip. Superb photos. Been thinking about this for a while. Now it seems I should begin planning instead. Such an intriguing country! I think the fact that Iran is usually presented in a negative light in the West just makes it more exciting to visit! The pictures, by the way, are stunning. I’m traveling in South America right now but your post really inspired me, I wish I would just go now! Beautiful pictures too! Wow! I think media reduces our perpective to politics but there is always so much to see in a country that gors beyond what we see in the news! Superb! Love this post. I think it’s so important to display the wonders of the Middle Eastern regions that Western media choose not to convey to their viewers told to fear such areas. Did you notice any glaring sociocultural scars left by Western interference in Iran? I’d be interested to hear the general perceptions that locals share about the select people in militarily strong nations that have unfortunately shown such disregard to places these people call home. Where in particular would you recommend to visit in Iran? Iran is amazing country many things to see Persian culture, i can list out few places as below for you, you can browse further to research. The first Iranian site registered with UNESCO, Chogha Zanbil is a 13th-century BC ziggurat in the Khuzestan province. Baked bricks with cuneiform inscriptions are layered in the structure, and a centuries-old footprint of a child in the stone is roped off towards the back. Qeshm offers pristine nature and a world of mystery, but if there’s one attraction not to miss, it’s the Valley of the Stars. Marl and sandstone make up the other-worldly rock formations, and with a little imagination, you can see animals, faces, and hands among other things. capital of the first Persian Empire and birthplace of Persian civilization, it’s vital that you visit Persepolis. In fact, you haven’t seen Iran unless you’ve walked in the footsteps of the ancient kings. Nasir ol-Molk is like walking inside a kaleidoscope. 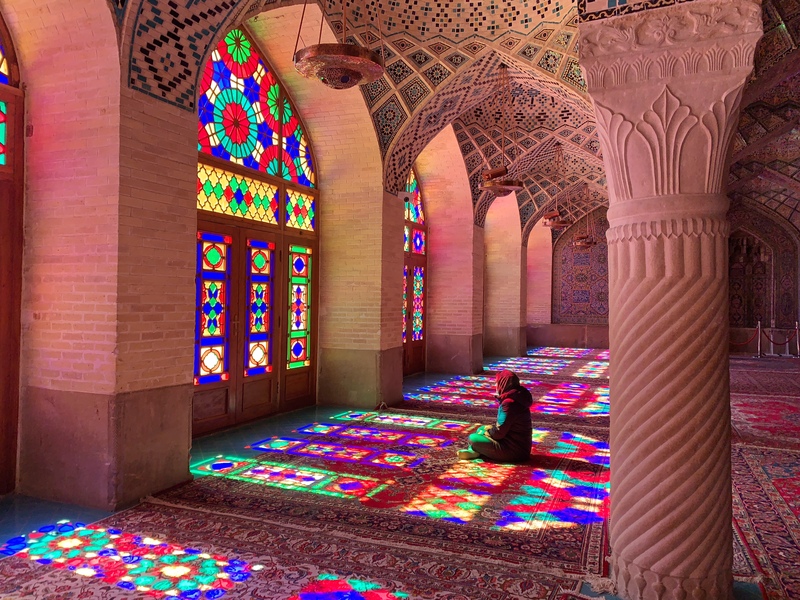 Nicknamed “the Pink Mosque” for its rosy-hued tiles, you’ll love discovering the hidden nooks of arguably Iran’s most beautiful mosque. royal polo field, Naqsh-e Jahan Square in Esfahan holds Ali Qapu Palace, Imam Mosque, Sheikh Lotfollah Mosque, and the Imperial Bazaar. For sure a full day trip to complete . an ancient irrigation system dating back to the 5th century BCE, is sure to leave you awe-struck. Climb the hill behind it to marvel at the view from above before exploring the details of the mechanism and the many bird species living here. A feat of engineering, the Shushtar Historical Hydraulic System. Whether it’s Si-o-seh Pol, the Khaju, or one of the other nine bridges, a romantic stroll along the marvelous architecture of Esfahan’s bridges on the Zayandeh River is a must. The Persian poetry often recited in these locales echo through the arched chambers and will seem like Scheherazade’s 1001 Nights. Sufi shrine the most beautiful, Located in Ardabil, this shrine is the tomb of Sufi mystic leader Sheikh Safi al-din. Different areas such as a library, mosque, school, and mausoleum make up this site, and the architecture is in keeping with the principles of Sufi mysticism. Zoroastrian temples in yazd province. Castle of 1000 steps called RudKhan castle. Jurassic period caves called Katalekhor caves. 14. Unesco site hottest place on earth desert called LUT. Bisotun and Taq-e Bostan are two historical sites located near each other in the Kermanshah Province. Rock reliefs and the statue of Hercules are fascinating remnants of Bisotun, as is the prehistoric “hunter’s cave” said to have been inhabited 40,000 years ago. Rock reliefs are also under the archway of Taq-e Bostan, the most notable image of which depicts the last king of the Sassanid Empire with Ahura Mazda (the creator in Zoroastrianism) and Anahita (a Zoroastrian diety). Dont forget saffron fields and process places also dates the best in the world. If you have interest you can see the most biggest oil processing plants refineries bitumen manufacturing units, world famous bandar abbas port and many small sea ports of old ages but most modern utilities . Tehran its hard for vegetarians but can live with plenty fruits and dates. The world best fruits available here and can enjoy the best of their taste. Its an endless journey we can’t complete in one month travel for sure to see in detail ideal to split as per seasons and visit few times. Before simply jumping to travel check the consulate cultural dept or tourism board for more details. Research google for the seasons as summer will be super hot, not advisable for most of cold country people for sure. In past i lost my camera and fail to preserve the pics i took but now less chances to go back there again due sanctions and troubles, crowd can be violent as well most of the times as reforming going on. Also must follow strict religious respects as it may trouble one for violating, people are kind if you greet them local language or in respectful way . In general take best advises from the local embassy they will be kind to guide you. Some day if you plan to go there don’t forget to taste delicious fruits and dates , we wont get same taste for sure In the of the world i can say. Thanks – as an Australian I’m well aware of the sweltering conditions that are apparent in summers! I appreciate your detailed response, hopefully I can scrape together the funds to get to Iran someday soon! Beautifully written and tempting photos…Iran just went on my travel list!! Undoubtedly one of the most convincing articles I have read. I feel like packing now. if i could go there! what a beautiful country, I would love to visit, the pictures are fantastic! Such a stunning post!😍 All the pictures add glamour to it! Oh my gosh! That looks so beautiful! Great pictures throughout. Did you travel solo? Any suggestions for planning a trip there? Amazing! I have never conceived Iran as such. From what I learned from an Iranian friend everything is so limited just like what you mentioned, the facebook, banks, money remittances, etc. I thought people are so boxed that they hardly have windows to the world. I love the way you described Iran and I began to love it. In time i may visit the place. How I wished I could. Thank you very much. that was great! Amazing! I would love to see Iran in the future. Thanks. Beautiful people, (and though I’ve never been ) a beautiful country. Excellent post. I would never have thought of visiting Iran. Now I’m looking forward to it! My view about Iran changed when i visited their stall in the Global Village in Dubai. Your post just adds more fuel to the fire of me wanting to visit this place. Wonderful narrations. I would love to visit Iran. Woow.. i love all these pics. I wish i could go there to see all these pics by my open eyes. Previous PostHow to Travel as a Vegan and Find Delicious Food Anywhere in the World. Next PostIf the World Was a Library, These Books Would be the Destinations I’d Pick.